Update, 9:30 AM. 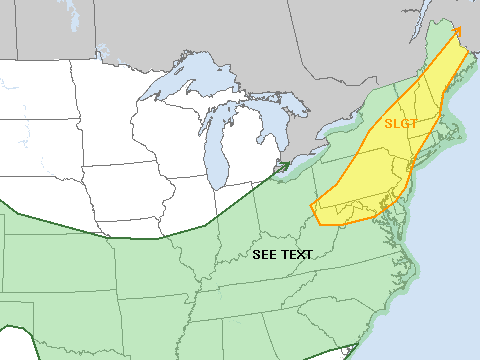 God bless the Storm Prediction Center and its 100th "day of" upgrade of the I-95 corridor to include most of the region in a slight risk for severe thunderstorms. The rest of the discussion below really hasn't changed much from an hour ago -- I do think the best chances for severe weather continue to reside to our west and northwest but we do run the risk of localized severe storms. Heavier rains may ultimately be the bigger threat around town today. Thunderstorms are possible in our region as early as the midday hours and could be in a few scattered lines of activity through Pennsylvania that will push east and northeast through the course of the day. The first line will approach western sections of the region towards midday and then gradually lift northeast towards New Jersey. If modeling is right, we could see a few scattered lines of storms as the cool front (shown below across Ontario back towards Detroit) slides east through the course of the day. Any thunderstorm that fires up, whether in a scattered line such as the NAM depiction above or the HRRR depiction below, will have the potential of producing very heavy rainfall in short order. PWAT's peak at 1.9 to 2.0 across the region around the dinner hour, as the front is approaching, so any thunderstorm that does fire up will have access to quite a bit of moisture and could dump a lot of rain in a short period of time. In addition to that heavy rainfall potential, some of the stronger storms could produce localized wind gusts to over 50 mph in downbursts and straight line damage. While the risk for that is a bit higher north and northwest of the city, the potential exists on a more limited scale locally. The best chances for us would be in any midday thunderstorm activity that fires up as the front itself moves through during the evening hours, with limited daytime heating to work with. Thunderstorm chances will continue into the evening hours before tapering off towards midnight as the front slides through the region.